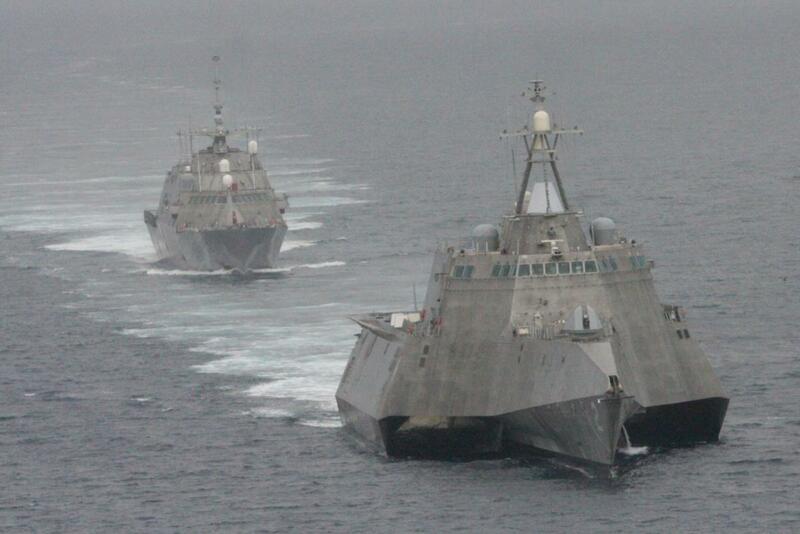 The Navy has issued $1.38 billion in contract modifications for four Littoral Combat Ships split between shipbuilders Lockheed Martin and Austal USA, according to a Monday Pentagon contract announcement. The ships — which were paid for in the service’s Fiscal Year 2014 budget — will be the last planned two-a-year buy for the LCS program, according to the service’s FY 2015 budget which was issued last week. According to the Navy’s Future Years Defense Plan (FYDP), the service will buy three LCS a year for a total of 32 — down from an original buy of 52. Lockheed was awarded $698.9 million for two ships — USS Indianapolis (LCS-17) and the yet-unnamed LCS-19 — of the Freedom-class (LCS-1) variant, according to a statement provided to USNI News from Lockheed Martin. Austal USA was awarded a $683.7 million modification for Independence-class (LCS-2) for the unnamed LCS-18 and LCS-20. The Navy still has four options for ship construction left in the contract deal, originally announced in late 2010 as part of a $8.9 billion deal for 20 ships from both Austal and Lockheed. In late February, Secretary of Defense Chuck Hagel announced the Pentagon would cap the current buys of both variants of LCS at 32 — 20 less than planned for by the Navy. The Navy and the Pentagon are currently undertaking a study to find a follow-on ship to the current Flight 0 LCS. The more lethal and survivable ship could more closely resemble a more traditional multi-mission frigate or be a modification of an existing LCS design.